East Midwood Jewish Center is a vibrant, egalitarian, Conservative community in the heart of Brooklyn. Since 1924, we have been a house of worship, a place for Judaic discovery and action, and a haven for learners, seekers, and questioners. Welcoming to all, we are host to a range of Jewish voices. Our community is made up of married and single people, with and without children, straight and LGBTQ, interfaith families, and other families who are exploring their Jewish path. East Midwood Jewish Center was founded in 1924, when its section of Flatbush was largely an area of widely spaced one-family homes and extensive stretches of open fields. Brooklyn College had not come into being yet, and Bedford Avenue was still unpaved. East Midwood was “out in the country.” Jewish families who had begun to settle here were deeply concerned that there was no Hebrew school nearby. Our Center was created out of the commitment of a small group of individuals who came together to establish an institution to provide for the Jewish education, spiritual, and social needs of the area in which they lived. They realized that there is no future in Judaism without strengthening the present. 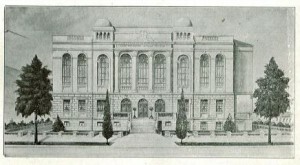 The cornerstone of the building was laid on June 13, 1926. 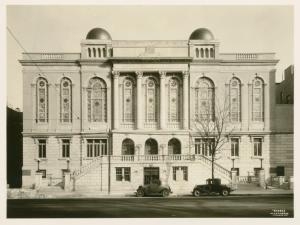 In the autumn of that year the building was fully enclosed and High Holy Day services were held within the building, officiated by Rabbi Reuben Kaufman, our Center’s First Rabbi, and Cantor Jacob Schraeter. The building was completed in 1929, at a cost of about one million dollars, and remains one of the most beautiful synagogues in the City of New York. Rabbi Harry Halpern accepted the call to serve as our Rabbi in February 1929. This mutual association of Rabbi and Center proved a most fruitful one for many, many years. During the Great Depression financial trouble assailed the growing Center. As times improved, membership began to climb slowly. In 1934 there were 300 members. Ten years later the membership rose to 1100. Adult classes became part of the Center’s educational program, with courses offered in Hebrew, religious customs and ceremonies, the Bible and Zionism. During World War II, the men and women of the Center participated actively in war efforts and drives, including the sale of millions of dollars worth of War Bonds. Many members contributed to the Blood Banks, and women volunteered to serve with the Jewish Welfare Board, Red Cross and U.S.O. Our boys served in all branches of the country’s military forces. Some made the supreme sacrifice. In November 1950, the new school building was dedicated for the use of the Talmud Torah and Youth Activities. Enrollment reached a peak of close to 1000 students in the early 1950. We established the East Midwood Hebrew Day School to be conducted in accordance with conservative Jewish traditions. The Day School, which began with only three grades, grew into a full eight year program where both Hebrew and secular subjects were taught. It became so popular, that the Congregation build a new building to house it in the 1950’s. The Day School, chartered by the NYS Board of Regents, operated as a self-sustaining entity for decades until 2018, when it reorganized itself, and modified into a more orthodox tradition. Alongside the Day School, our Congregation always maintained a Talmud Torah, which in 2007, grew into our congregational school, now called our Room J program, which has been growing ever since. In 2006, a gala celebration at East Midwood Jewish Center marked its listing on the National and New York State Registers of Historic Places, which recognize it as an outstanding representative of early twentieth century synagogue design and for its significant role in the development of the New York Jewish community, American democracy, and cultural pluralism. East Midwood Jewish Center’s task today, as it was in 1924, is to transmit to new generations and the public at large the relevance and beauty of our religious traditions, and the Jewish emphasis on education, social justice, and our mutual responsibilities to each other. In 2016, we are proud to be participating in the USCJ Ruderman Inclusion Action Community, sponsored by USCJ in partnership with the Ruderman Family Foundation.